POSTED February 6, 2019 2:11 p.m.
GAYS MILLS - Hello my dear readers, I have returned to the Independent-Scout Mother Ship. Likely, as you’ll be reading this you’ll have hopefully passed the worst of this epic winter weather we are facing down, or at the very least have stayed snug in your homes. I, however, chose to drive into work bright and early Monday morning to make the tootle from Gays Mills to the City on the Move-Fennimore. I’m not sure if word has gotten out yet, but shortly before taking my maternity leave I was promoted to become the editor at the Fennimore Times. One of the perks of this long drive is ample time to listen to podcasts and drink coffee. And even on a snowy day, our faithful plow drivers were working diligently to ensure folks like me glide in just fine. This of course calls for the eternal thanks and gratefulness to them for their efforts. Maternity leave has been pretty magical and fun, but also wonderfully lazy. I had intended to write a column several times, but some how, never got there. The birth of Mister Baby, as we like to call him, wasn't at all what we had planned, but was just as great as it could have been. 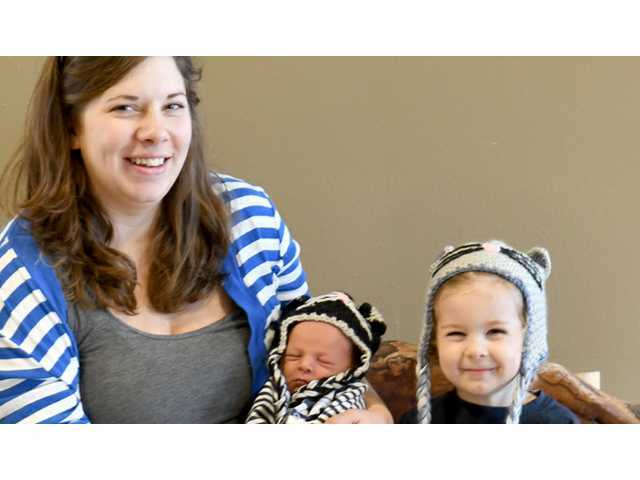 Waylon Francisco Dremsa was born on November 30, his due date, at 4:28 p.m. at Crossing Rivers in Prairie du Chien. I started the day expecting to give birth at the Trillium Midwifery Birthing Center in Prairie du Chien. However, thanks to my high blood pressure, which decided to finally peak that day and cause a pre-eclampsia diagnosis, I was transferred to the hospital. This was so very hard for me to swallow at the moment. Although I knew my midwives had my best interest in mind, I still cried every time the nurses looked at me. I was luckier than most however to have the loving support of Chasca, my two midwives Allison and Heather, as well as the full attention of the OB staff at Crossing Rivers. This included many wonderful nurses and two more midwives. In an effort to keep my blood pressure down and progress my labor, I received many a wonderful foot massage and fun conversation while bouncing on a yoga ball. I had chosen to not get an epidural, but knew that good ol’ laughing gas was available as a pain management option. It's a much lower concentration than you receive at the dentist and has no effect on the mother or babe, so it is a great option to go for. And boy, did I need it. The pain of labor hit me like a Mack Truck, unexpected and hard. I hardly remember much time between happily sitting on the big green ball, jabbering away to Allison about a story I had written, to the moment I was laying on my side moaning away like some type of wild animal dying slowly in the woods. It was at this time, I put aside my usual Midwest-polite hospital attitude of not really wanting to inconvenience anyone with MY needs. I requested assistance to get in the whirlpool tub, with a cool washcloth and fan. It was deluxe accommodations, when Chasca and Allison sat with me, telling me how wonderful I was in between my bellowing and cursing. A short time after, I requested the gas. Although the process of self-administering laughing gas is a bit awkward and the mask makes a silly farting sound, the result is quite delightful and makes getting through the hardest part of labor, quite a bit easier. The urge to push hit me hard and I once again put aside my modest Midwest polite attitude and began shouting “I NEED TO PUSH!” – I had dilated dramatically from four centimeters to nine centimeters in what seemed like a matter of minutes. I was heaved out of the tub, in a haze and walked over to the bed. I barely got one leg up before the urge to push truly over took all of my senses. Much to everyone’s surprise, Waylon made a speedy entry into this life. It took him about two or three pushes to show up, and he cried immediately, causing me to hear him before I saw him. Still in a bit of a haze I stood there, politely waiting for them to issue me my baby as he was still behind me in my midwifes hands. When he was handed over, he was a beautiful little thing with a nice round head of hair and a delightful pink tone to his skin. All was well in the world and we celebrated our first nights as parents to a second little one, eating pizza and cooing over his glory. Having two has been quite a ride, but luckily it's an easy one. Thatcher is overly infatuated with Waylon, calling him Waylee Bopper and proudly exclaiming “HE’S A HUMAN NOW!” He reminds everyone that Waylee Bopper’s “head is VERY soft, and he’s VERY fragile.” And he hasn’t even tried to touch his soft spot yet, which is certainly a win in my book.